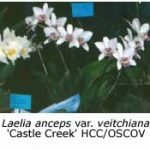 After a few years, new orchid growers generally begin to seek other genera to broaden the variety and flowering season of their collections. There are many possibilities, especially if the cymbidiums are being grown in a shadehouse fitted with a fibreglass or polycarbonate roof, which protects the plants from mild frosts and allows control over the amount of water that the plants receive, regardless of weather. Those with a shadehouse without a solid roof can still provide their plants with protection from frost and frequent rain by fitting a temporary cover of plastic sheeting, such as Solarweave®, in winter. If you simply intend to fill in the spaces between your cymbidium pots with companion plants, think again. Cramming the plants together causes overshading of one plant by its neighbours, and the resulting reduction in air movement produces ideal conditions for the development and spread of spider mite (red spider) and scale infestations. If you cannot insert a pot (of the same size) between each of your cymbidium pots, then you don’t need any companion plants, you need another shadehouse! Zygopetalums are often the first choice. These South American species and their hybrids have mature plants of similar size to cymbidiums and often flower twice each year, once in autumn and then again in spring. The flowers are usually characterised by attractive purple or purplish blue labellums and a delightful fragrance. Mostly the petals and sepals (collectively known as tepals) are green with brown bars but there are albino forms where the darker colouration is reduced or absent. 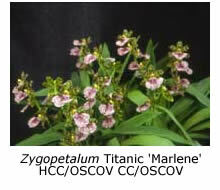 Zygopetalums most commonly grown are the species Zygopetalum intermedium and hybrids such as Z. E.G. White, Z. John Banks, Z. Titanic, Z. Blue Eyes, and the intergeneric hybrid Zygocolax Elfin Jade. Sometimes the foliage of zygopetalum plants suffer from unsightly spotting, which is generally attributed to cold, wet conditions during winter. By providing better air circulation and ensuring that the foliage is dry by nightfall, this spotting can be reduced. Pleiones may also be grown with cymbidiums, although their pots will have to be moved to a sheltered spot during the dormant season (winter) and ensuing flowering season (early spring). Pleione bulbs are best kept dry during winter and the flowers last much longer if kept dry when watering the plants in spring. But for the rest of the year they may be grown as companion plants for cymbidiums. Various cultivars of Pleione formosana with mauve, pink and white flowers are readily available and hybrids such as P. Versailles, P. Tongariro, P. Alishan etc. with pink, even purplish, flowers sometimes appear on the sales bench at flowering time. Hybrids with yellow flowers (e.g. P. Shantung) are still expensive. Lycaste hybrids, particularly those bred from Lycaste skinneri, also grow and flower well together with cymbidiums, and benefit from a similar routine of watering and fertilising (frequent in summer, much less in winter). 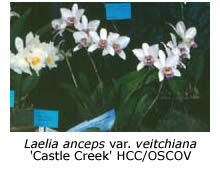 Well-grown hybrids may have plants as large as or larger than those of standard cymbidiums. 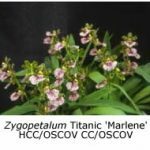 I suspend many different orchids in pot hangers from the roof of my cymbidium shadehouse but you must consider the consequences for the plants below. If plants can be hung above the walkways they can do little harm beyond the occasional bumped head (if hung too low). But when hung above the cymbidiums they may unduly shade the plants below, damage tall flowering spikes and perhaps transfer fungal infections via water dripping on the plants below. Orchids that do well for me suspended below the shadehouse roof include Stanhopea nigroviolacea, Laelia anceps, Laelia gouldiana, Maxillaria porphyrostele, Arpophyllum spicatum and many oncidiums. Last but not least are a large number of Australian native dendrobiums, which seem to grow so much better when their pots are suspended rather than placed on a bench. So go ahead and expand your orchid collection – it’s the best way to broaden the appeal of our great hobby.